nyc2vin: Mama Meets Minnelli - Happy Birthday LIZA ! 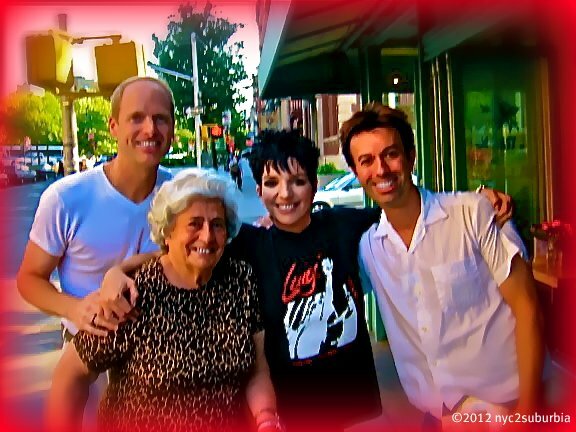 Mama Meets Minnelli - Happy Birthday LIZA ! There are certain things in your life that you never forget. The first time I met Liza Minnelli was one of them. It was so unlike meeting Barbra Streisand because that meeting was by winning a contest. I thought what the heck, I'll enter it... what are my chances of winning - but I DID win! However meeting Liza was even more special for me for the reason that it epitomizes the NYC experience that I miss. It was a chance meeting on the street, no contest, no anticipation, just a typical day in NYC! My partner & I were walking on Hudson Street in the West Village to visit Mama at the Village Nursing Home. As we were walking past a Thai restaurant this animated woman caught the corner of my eye & I slowed down. Could it be? No way? Is it? OMG, it is!!! I said to my partner, there's Liza Minnelli! Slow down, stop & listen to me. He continued to walk & looked at me like I was nuts! I glared directly into his eyes & told him to go back to our apartment quickly, get the camera, a red marker & the Liza "Gently" CD. I must've looked possessed, because he quickly followed my instructions. I continued to "casually" walk across 12th Street to get Mama sitting on a bench outside the nursing home. I told her she had to get up quickly & walk to the corner so that she could meet Liza Minnelli. Well, I never saw Mama walk so fast with her walker. My partner returned & the three of us are now strolling by the restaurant & realize that Liza is now standing directly in front of us on the street smoking a cigarette. WTF? Liza is in our way & she's smoking a cigarette! Vin with a Z is taking Anna with a Z to meet Liza with a Z. We are Z'd to the max! Lightly tapping her on her shoulder, I introduced us to the one & only inimitable Liza. She was gracious, she was cordial, she signed the CD, she smiled & posed for a few pictures with us & she hugged us all. Liza kept talking & talking almost as if we had known her for years, just like you may expect Liza to do. She even called me "Daddy", since my name is Vincent, like her father, Vincente Minnelli. She made my day, but more importantly she made my mothers day! It was such a memorable meeting, that even though Mama has dementia, she still has never forgotten that day. She keeps the photo taken of the four of us by her bedside in the nursing home. I reminded Liza of the incident upon running into her a few years later & she was very touched by it. I have a bond with Liza & it goes back to my childhood. The edited version is I always thought she was my half sister since I was convinced Judy Garland was my real mother (that is another story I will share at a later date). Meeting Liza was an unforgettable experience, one that meant a lot to Mama & I am eternally grateful to Liza for that chance meeting on a NYC street. Until this day Mama still recalls the incident fondly... So Happy Birthday LIZA! May you continue to bring joy & share your love even with "strangers on the street". You are one talented, generous Dame... so enjoy your birthday & know how much you are loved! Thanks again for visiting my blog, spread the word about my blog & "Follow" me already. Feel free to leave your comments... Whaddya waitin' for? This is a great story! 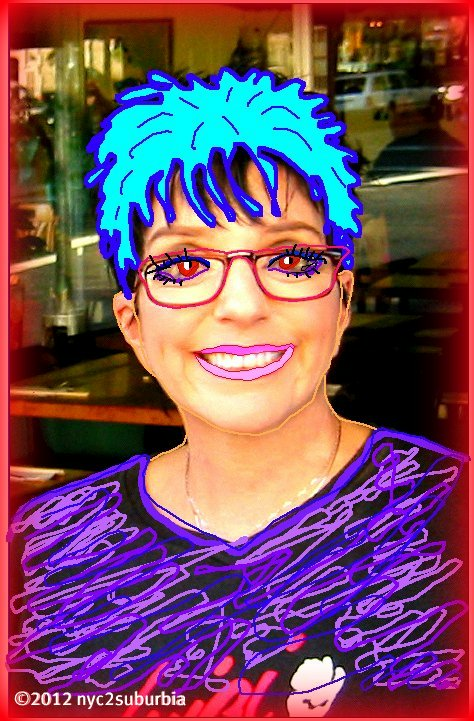 How much Liza has meant to you and your mama by just a brief encounter. Yeah, H.B. Liza! Thanks so much for the kind words. Fortunately, I have had a few encounters with Liza & she has consistently been a genuine doll. My Mama loves music & loves to sing, it helps with her dementia. Whenever Liza was performing, we would go see her. The last performance Mama was able to attend, due to her physical state, was "Minnelli on Minnelli". She loved it. So glad you enjoyed it & thanks for posting your comment. I LOVE to hear feedback & yeah, Mama is some trouper!!! Check out my YouTube Channel "nyc2suburbia", there are even a few more videos of "Anna with a Z"... Please spread the word. You guys are really lucky, I also hope I get a chance to met her. Thanks.